Welcome to Stick Mark Boom! So how do two, full-time teachers end up also running an education company, providing the marking, assessment and feedback solution to end all marking, assessment and feedback solutions?! Well, one of us was working flat-out as a member of the SLT and Year 6 class teacher, struggling to mark 34 books every night. She was pretty good at marking, knew how to make it developmental, but got bogged down in writing long, constructive comments, that the children didn’t bother to read half the time! The other, was a young Year 5 teacher, who had a creative flair, bags of enthusiasm, a ‘can-do’ attitude and a love of stickers – so much so that he was known within the school as Head of Stick Services, or HOSS for short. One night, sitting together with a joint pile of English books that needed marking, a beautiful idea was born… why didn’t they merge their approaches, Stick, Mark and…. Boom! 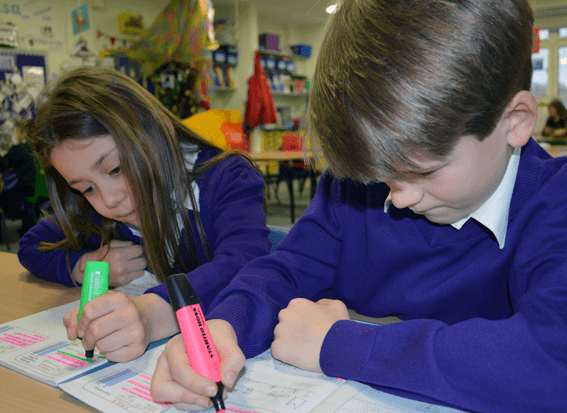 Coming up to KS2 SATs, Nikki was using lots of Pitch & Expectations questions to assess the pupils’ knowledge and ability to apply it to exam style questions, but she was photocopying them, trimming them and the children were going through a tonne of glue-sticks a day, so…. Danny said he’d ‘Stickerfy’ them for her. And, while he was at it, he pointed out that he could write even better questions himself – and the Next Step Sticker was born. Therefore, what started as a couple of success criteria stickers, quickly spiralled. Other members of staff were asking for stickers to be written for the unit they were about to teach, and friends at other schools were stealing examples on courses. At this point, we were still Stickerfying for fun, but then came the dreaded OFSTED call… would they like our approach? What we hadn’t realised on that day, was how the idea would grow. Starting with English, one success criteria per text type, turned into three to help differentiate, but that wasn’t quite enough – we all know the range of abilities in any given class after all – so that turned into nine per text type. Then Danny had the marvellous idea of putting his classroom ‘Magpie Nest,’ (a word bank, choc-full of exciting vocabulary) onto – you guessed it – a sticker, so Magpie Nests were created. Consistency was our issue. Given that we are control-freaks, who always want things to be just as we like them, we decided that the only way to get everyone on-board, with the same approach, was for us to write all the stickers. ALL THE STICKERS …………….. for English and Maths, for every objective, for every year group! And if we were going to do it, we might as well do it properly. So rather than a rushed job the day before someone was teaching a lesson, we collaborated during the Christmas holidays and planned out the whole thing and made it a consistent approach. By now, Advisors were praising our approach and bringing other colleagues into our school to learn from its success – likewise interested Heads were visiting. By now given that we were doing this in our own time, at weekends, holidays and evenings, wasn’t it…a business?! Thus Stick. Mark. Boom! Ltd was born. We both still have the sticker bug and don’t seem to be able to stop writing stickers, no matter how often we say we are finished. In schools, you are never done because there is always something new (ITAF anyone? ), or refinements and improvements that can be made. 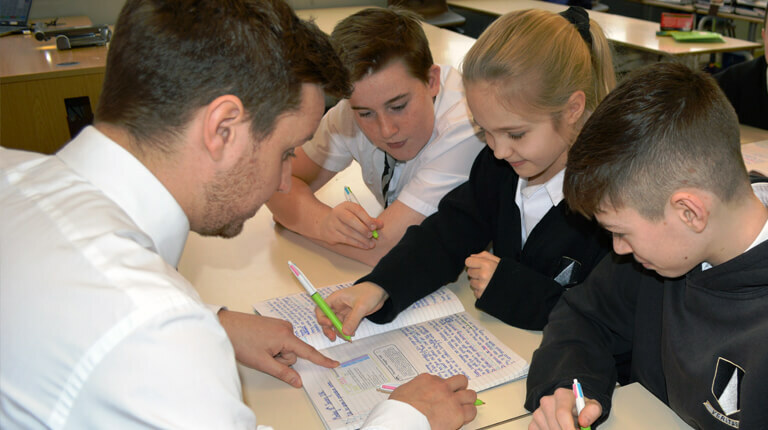 SMB has definitely improved the quality of teaching and learning in our own school – it has made teacher’s lives easier, reduced workload and, as Leaders, we have seen a massive impact in the consistency and pitch of teaching across the school. If you want to see what other people are saying about it, have a look at our testimonials and quotes from happy users, including (most importantly) the children. We love the SMB Approach, and we hope you do too! A former Science Party and Summer Camp Organiser turned Teacher. Currently Assistant Head of a one-form-entry Catholic Primary School and Director and Co-Founder of Stick Mark Boom Ltd.
Nicola is a former Commercial Litigator, turned Teacher. Currently Head of a one-form-entry Catholic Primary School and Director and Co-Founder of Stick Mark Boom Ltd. Copyright © 2018 Stick Mark Boom!